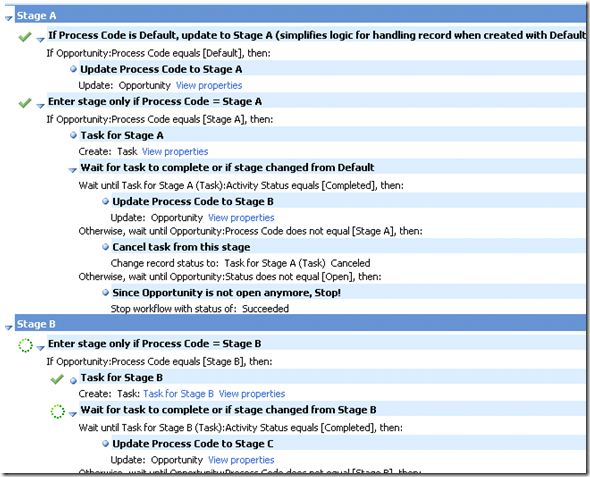 Please see the blog article Microsoft Dynamics CRM Sales Process for an introduction to sales process workflow in CRM. In this article, I will present an approach which can be used to move the workflow from one stage to another (forward only) using a custom attribute and a series or Wait and Parallel Wait steps. 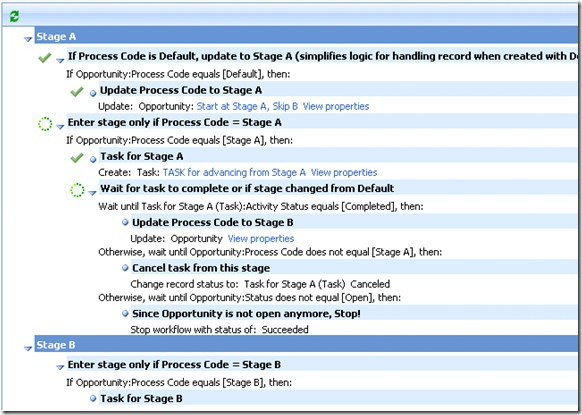 The condition and parallel wait steps in the Microsoft Dynamics CRM Workflow designer may be used to implement business logic that needs to respond to various changes in the system. 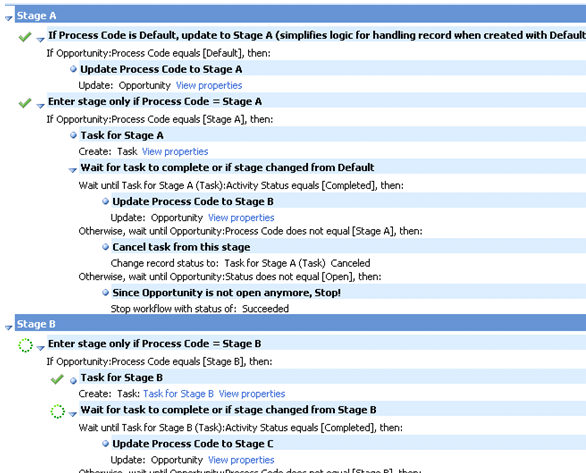 For example, we can create a multi-stage workflow where certain steps can be skipped based on user input. This article uses Microsoft Dynamics CRM v.4, but it is applicable for Microsoft Dynamics CRM 2011 as well. 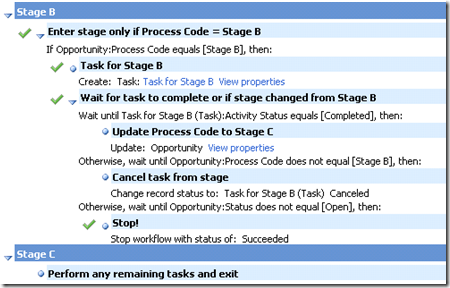 A ‘Wait’ step in a CRM Workflow enables the workflow author to define a step that needs to wait for some user action to take place before the workflow can proceed. For example, a task that needs to be completed. The parallel wait step lets the author specify an alternate condition that would require the workflow to be canceled – for example an opportunity is ‘lost’ before all the steps in the workflow complete. 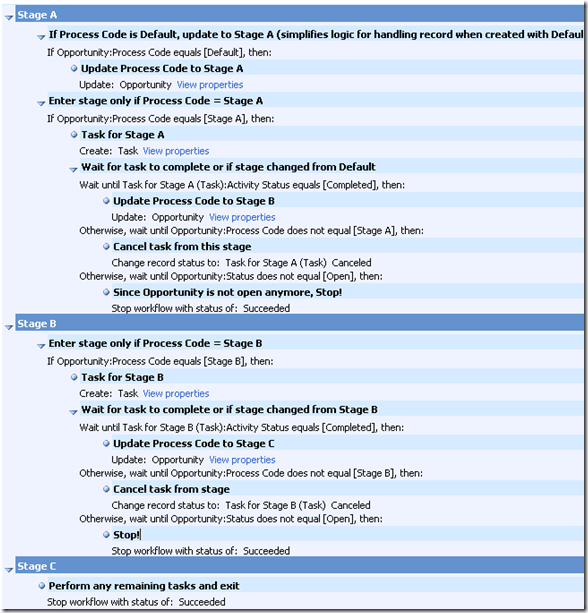 Each stage in the workflow checks for the value of the attribute before executing the steps within. At the end of the stage, an update step is used to update the stage to the next stage value. Now let’s create two opportunity instances. 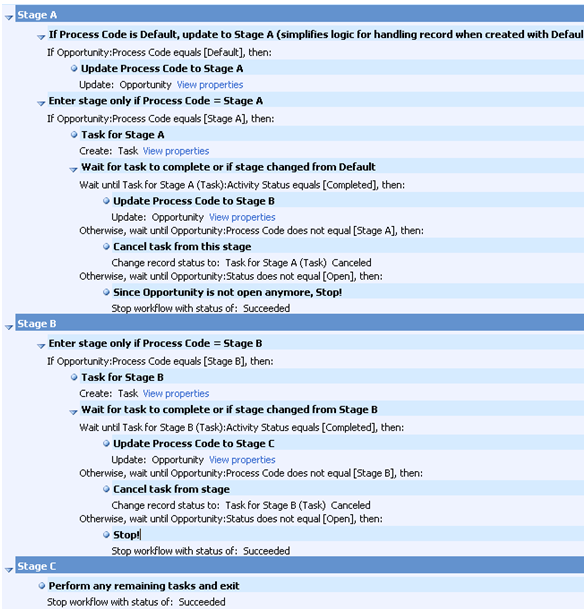 The first one would set the Process Code to Stage A (or Default), second one sets the process code to Stage B. 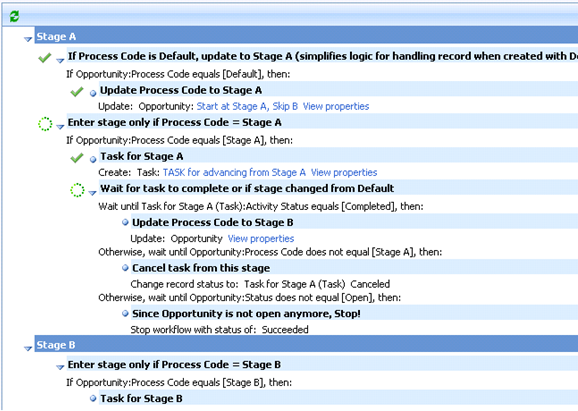 For the first opportunity record, you can see that the workflow executes ‘Stage A’ steps. 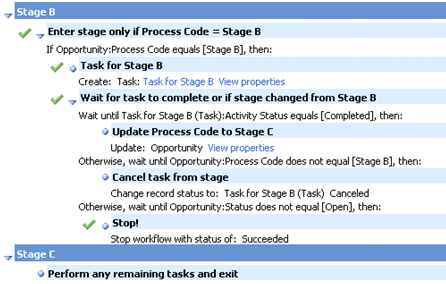 If you update the opportunity record with ProcessCode=Stage C. The workflow will skip remaining steps in Stage B and proceed to Stage C.
If you have many workflow instances in ‘Waiting’ status, it will eventually lead to performance issues. You can add a Parallel Wait step that waits for a period of time to ensure that workflows don’t wait forever. If you have completed workflow instances that are no longer needed, you may want to delete them using the CRM application or using Bulk Delete. In Microsoft Dynamics CRM 2011 you can mark a workflow definition so that workflow instances will be deleted once the workflow completes. To access this flag, click on the ‘Administration’ tab. The checkbox is at the bottom of the dialog titled “Automatically delete completed workflow jobs (to save disk space)”.